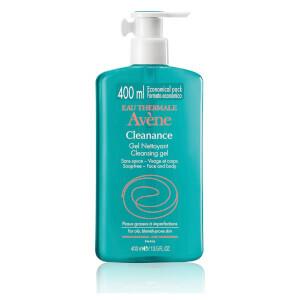 Rich in Avene Thermal Spring Water, Cleanance Soapless gel cleanser gently purifies the skin. Glyceryl Laurate helps to reduce excess sebum. This cleanser leaves the skin with a sensation of freshness and well-being. Use morning and evening. Apply to moist face, lather up, rinse thoroughly and dry. Avene Thermal Spring Water, (Avene Aqua), Water (Aqua), Sodium Lauroyl Methyl Isethionate, Zinc Coceth Sulfate, Polysorbate 20, Sodium Cocoamphoacetate, Ceteareth-60 Myristyl Glycol, PEG-40 Hydrogenated Castor Oil, Citric Acid, Disodium EDTA, Fragrance (Parfum), Glyceryl Laurate, Green 5 (CI61570), Sodium Benzoate, Sodium Hydroxide, Yellow 5 (CI19140), Zinc Gluconate. Such a lovely cleanser, feels so clean and removes of all my make up and grim from the day, leaving my skin feeling super clean and fresh, Would highly recommend to all as their go to face cleanser! Cuts straight through a days worth of makeup, even waterproof mascara! I love that it's a gel so it glides on and you can easily wipe it off with some cotton without even the need to rinse. This is my new go-to cleanser! Great cleansing gel removing the most stubborn of makeup . Have seen a dramatic decrease in spots & blemishes Would definitely buy again! Great cleanser for my sensitive, acne prone skin!! Tried this on the recommendation from a friend. Why did I not know about this cleaner until now? I have tried so many cleansers, but this is very gentle on my sensitive skin. Love the fresh scent. My face feels very nice after washing. Not drying or harsh like some cleansers. A little goes a long way. Has a very nice lather for a soapless cleanser. Just repurchased to have a spare on hand. This is my new favorite product. I have tried so many acne cleansers and this one is definately one of my favorites. It foams up nicely, has a pleasant scent, helps to clear up acne, and doesn't irritate sensitive skin. It also removes make-up easily, both face make-up and eye make-up without any stinging or burning. If you've tried every acne cleanser and they all irritate your skin then give this one a go.